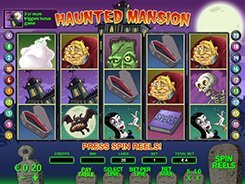 Haunted Mansion is a ghost-themed video slot with 5 reels and 20 paylines. The background image depicts the haunted house lit by the full moon, and the control buttons beneath the reels are placed on grey tombstones, thus creating a truly immersive gaming experience. The reels are stuffed with scary but funny cartoonish symbols including a vampire, a witch, a ghost, a bat, an open coffin and other themed icons. By adjusting a coin size ($0.1 to $10), the number of coins per line (up to 5), and the number of active lines you want in play, you may place as low as 10 cents and as high as $1000 per spin. The slot features a wild, a scatter, a Bonus symbol and a Free Spins symbol. A wild represented by the Monkey substitutes for regular icons and pays out the slot’s second largest jackpot of 1500 coins ($75,000 on the max stake). Besides, you may get up to 30 free spins by hitting 3 to 5 Zombie symbols across an active payline. On top of this, Haunted Mansion offers a whopping jackpot prize worth $200,000 if you line up five Vampire symbols. PLAY FOR REAL MONEY!